O My God is a dark comedy set in the Tel Aviv office of Ella, a psychologist who laments her son's autism. His illness challenges her to the breaking point regarding her beliefs in God, religion, the human condition, and her own existence. One day, she receives a phone call from a new patient who insists on seeing her immediately and when the man arrives and introduces himself, Ella is faced with the challenge of considering what God truly means, how we accept faith, and how these concepts help us navigate each day of our lives. Mike Burstyn is an internationally acclaimed American/Israeli actor with many and varied international credits, include stage appearances in New York, Los Angeles, regionally in the US, London, Holland, and Israel. Broadway credits include Barnum, Inquest, The Megilla, and Ain't Broadway Grand. Other stage credits include Lansky, The Rothschilds, On 2nd Avenue, The Prisoner of 2nd Avenue, Fiorello! (Encores), Jolson At The Winter Garden, Lansky, Fiddler On The Roof, Guys & Dolls, Berlin To Broadway, and The Tale Of The Allergist's Wife with Valerie Harper, among many others. On TV, Burstyn has been seen on Law & Order, Saving Grace, HBO's Dog Watch, As the World Turns, The Cosby Mysteries, and more. He is fluent in and has performed in eight languages, and he is the recipient of multiple Israeli 'Oscars.' For more information, visit www.mikeburstyn.com. Maria Spassoff returns to WCJT having previously appeared in I'm not Rappaport and Last of the Red Hot Lovers. At Theatre 40: Lost in Yonkers, The Gamester, Round and Round the Garden, Three Postcards, Escape From Happiness, Romance.com, Nicholas Nickleby and Rosencrantz and Guildenstern are Dead. Other stage credits include Arcadia, Female Transport, King Lear, Henry V, Pericles, What the Butler Saw, and more. Playwright Anat Gov was born in Tiberias and joined the IDF in the 1970s, serving in the Nahal troops entertainment group, where she met her future husband, singer and actor Gidi Gov. She wrote scripts for television shows in which her husband participated, including the long-running entertainment program "Zehu Ze!" In the 1990s, she began writing comedies for the Cameri Theatre. Gov's most successful plays include Best Friends, Lysistrata 2000, Househusband, and Happy End. In 2012, she received the Gottlieb and Hannah Rosenblum Performing Arts Award on behalf of the Tel Aviv Municipality. Gov died after a long struggle with cancer in 2012 at the age of 55. There will be two preview performances of O My God on Thursday, April 16 and Friday, April 17 at 8pm, and opening is set for Saturday, April 18 at 8pm. Preview tickets are $20 and regular performances are $35. Student tickets (with valid ID) are available for $25. The running schedule is Thursday, Friday and Saturday at 8pm and Sunday at 3pm through June 7. Tickets are available online at www.wcjt.tix.org or by phone at (323) 821-2449. 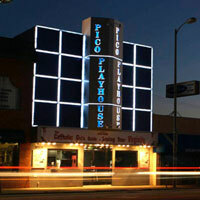 The Pico Playhouse is located at 10508 W. Pico Boulevard in Los Angeles, 90064.